For our 120th Chap Mei entry, we went to the vault and found something really nice for you... enjoy! 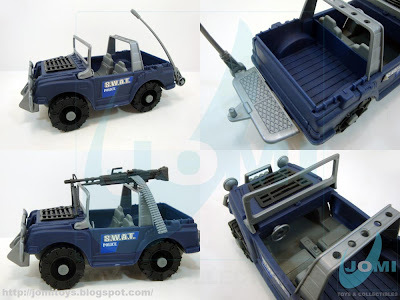 Some of the "bread & butter" Chap Mei vehicles, and some fantastic S.W.A.T. 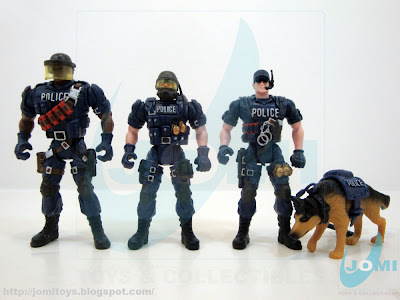 police figures in this deluxe play set. This line became almost as popular as the "company flag" Soldier Force. 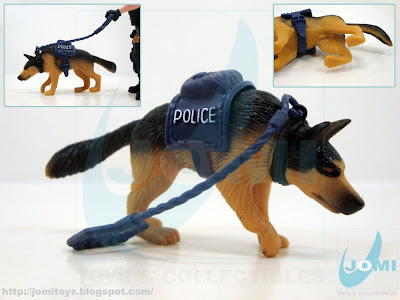 Figure: "Roadblock" police K9 officer. 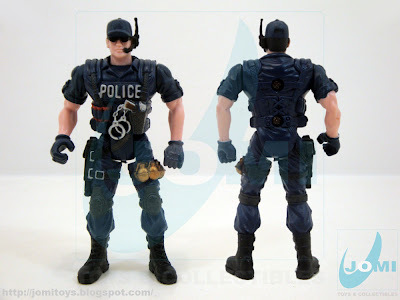 Figure: Unnamed, but looks like "Sergeant Thomas" as seen in "SWAT police Humvee" . Fully equipped for crime prevention! Jeep and helicopter trailer. A common sight when Chap Mei started out. 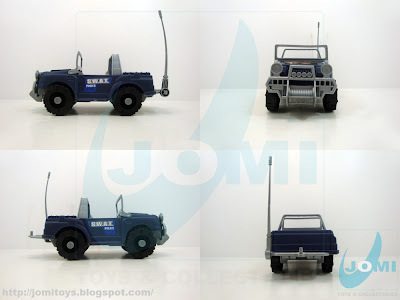 The first Chap Mei jeep. 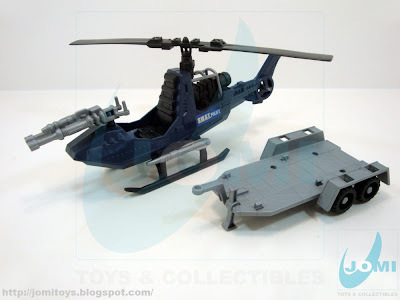 One of the reasons why G.I.Joe fans first started looking for this line. However simple this vehicle may be, its definitely cool and its use is wide. Also pictured, M60 mounted on top. That´s why those holes are for. 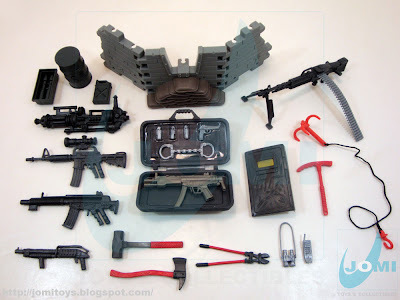 The G.I.Joe Cobra F.A.N.G. was without a shadow of a doubt, the inspiration for this one. We´ll see it in a more detailed manner in a future entry. Action shots with some Police Force S.W.A.T. team members. 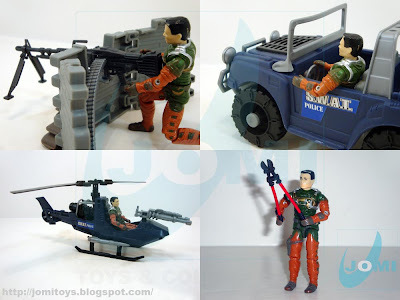 Scale shots with a RAH G.I.Joe figure. 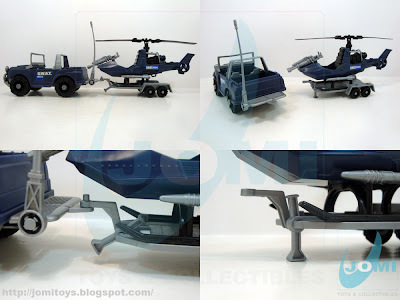 Chap Mei evolved immensely throughout the years, but these are some of their best 1:18 scale items (all discontinued). 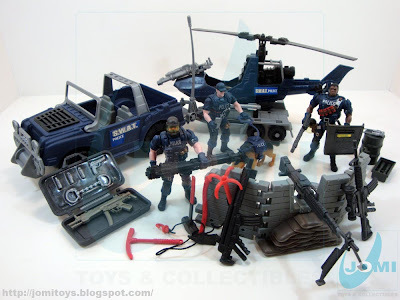 I'm a fan of everything that is 3 3/4 related to SWAT or police so I'm a fan of this set. This set rocks...I recentlt got this set minus the wall and helmets for the figures. 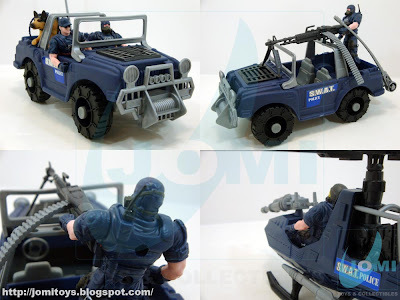 Aside from the vehicles for the Joes, the dog is a real added bonus...it's even more detailed than Order in the TRU exclusive 5 pack. 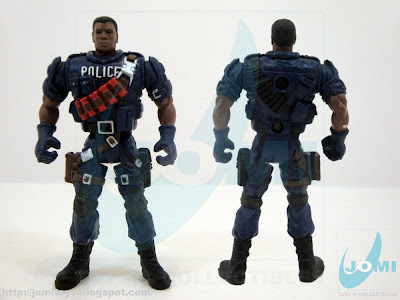 Compared to later Chap Mei figures, these guys are actually on the small side, save for Captain Faulkner, who still holds up pretty well. 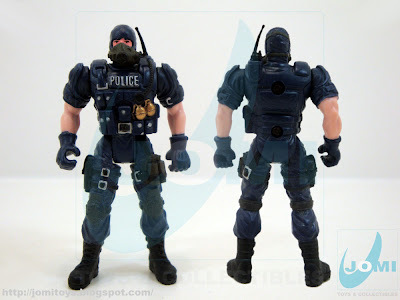 The sculpting on these is top notch though, and if I'm not mistaken there's two more figures like these. 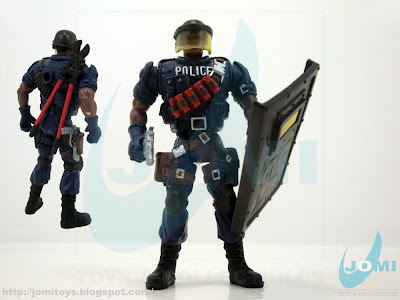 Are the two other figures you refer to the ones included in the "Police Force Series II Deluxe Action Figure Playset" post? 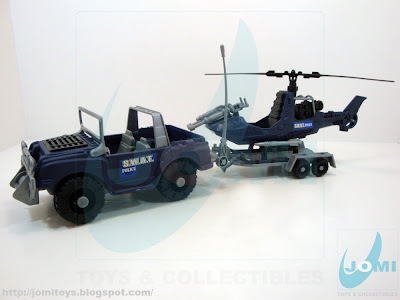 love the helicopter trailer. I had never seen it before until now. while the initial Police Force vehicles were basic in terms of mold and detail, they are still as good as the new ones in my opinion. thanks for posting! someone was willing to send him to Peru?